*Projects+ suite provides various workspaces from where the resources can be planned, reviewed and managed. This section highlights all the workspaces involved in the resourcing. There have been changes to Projects+ workspaces to show the resourcing forms depending on the user roles, such as project manager or resource manager. A new workspace has been created only for resourcing for the role resource manager. 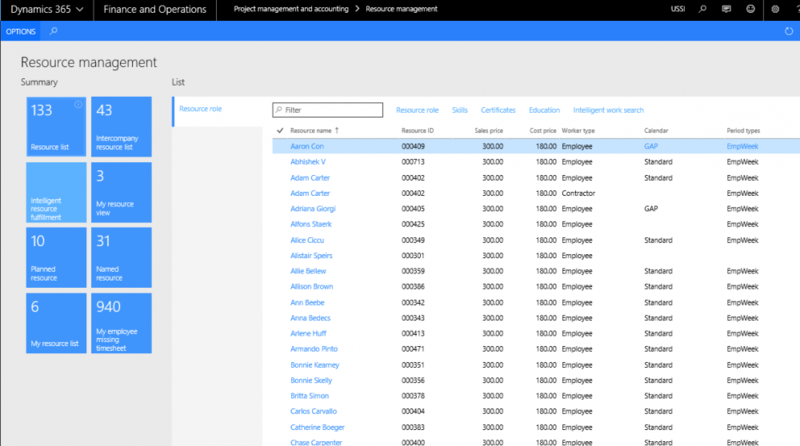 A new workspace has been introduced for Resource manager to be able to use all of the resourcing enhancements from one place. This workspace has the below contents. Resource list: Gives a count of all the resources in the current legal entity. Intercompany resource list: Gives a count of resources where the intercompany setups are done, so the resource could be borrowed from those companies. Intelligent resource fulfilment: Launches the intelligent resource fulfillment form. My resource view: Filters the resource view for the logged in user. Planned resource: Filters the resource view and displays it for only planned resources. Named resource: Filters the resource view and displays only the named resources. Gives a count as well. My resource list: displays all the resources for whom the logged in user is the timesheet approver. Resource role: takes you to the form where the list of resources along with the resource ID and role is displayed. It also has the sales price, cost price, worker type, calendar, period types, and source legal entity. Resource competencies are provided as links on the this workspace and has following options to view and update. Resourcing forms have been linked to the project management workspace to be able to use resourcing enhancements. 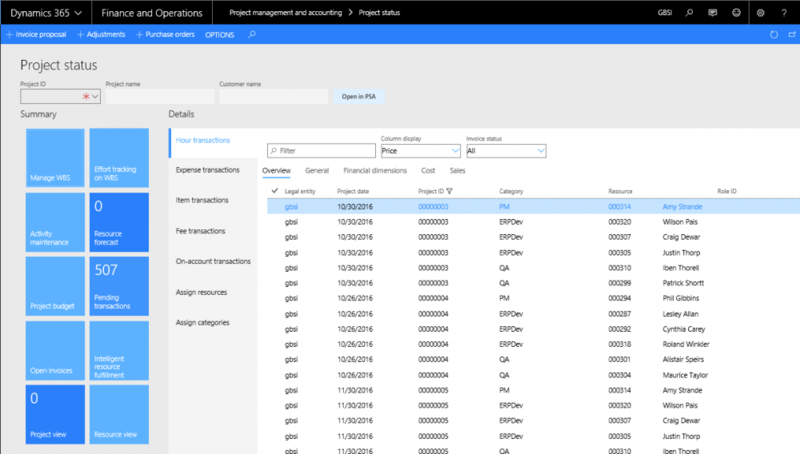 My project view – Tile: Where the project view is filtered for the projects where the logged in user is a project manager, will be visible. Resource forecast: for the selected project in the My projects list page. Project view: for the selected project in the My projects list page. Intelligent resource fulfillment: for the selected record in the My projects list page. Resource view: for the selected record in the My projects list page. Resourcing forms have been linked to the project status workspace to be able to use resourcing enhancements. Resource forecast: for the selected project on the Project ID field. Project view: for the selected project on the Project ID field. Intelligent resource fulfillment: for the selected project on the Project ID field. Resource view: for the selected project on the Project ID field. Resourcing forms have been linked to the project tasks workspace to be able to use resourcing enhancements. My resource assignment tile: Resource view filtered for the logged in user will be displayed on this tile.